I think most surveyors could tell you the theory behind roof spread and why it occurs but the reality is that we rarely see it in our day to day survey work; indeed this is the first case I’ve seen in 5 years so I thought it would be useful to outline the failure mode and the damage caused to the building concerned. 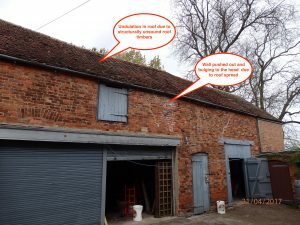 The building is large outbuilding on a property in Derbyshire, which was surveyed as part of a condition survey to the main building. 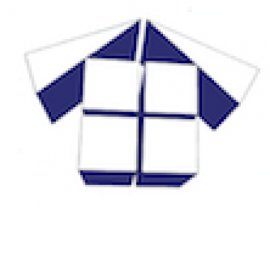 Roof spread occurs when there is a failure to adequately support the main rafters of the roof so as to prevent them spreading further open in a scissor type action. Since the rafters are fixed to timber wall plates sitting on the head of the masonry wall, then roof spread pushed out those wall plates, in the process pushing out the masonry below. Often the first signs are cracking, bulging or leaning to the head of the external masonry. 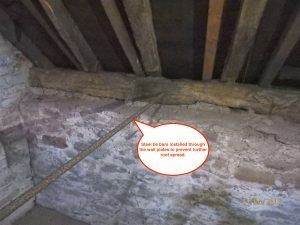 In this particular case the collar had failed at its connection with the rafter on one side and the rafters then scissored open causing substantial damage to the external masonry as the wall plates were pushed out laterally. There was also failure of the roof purlin to the same side and this had been shored up with a timber strut. 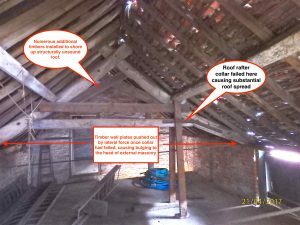 In fact several additional support timbers had been installed to prevent further collapse of the roof structure, though none had been installed particularly well. Interestingly we also noted that steel tie bars had been installed running through the building and through the wall plates to either side of the building. Again, the aim here was to provide lateral restraint and prevent the wall plates, and underlying masonry being pushed out even further due to roof spread. The building will be substantially refurbished, which will include complete renewal of the roof structure.